Pointers were invented by Harold W. Lawson in 1964–65 in the context of the PL/I programming language. In 2000, he received the IEEE Computer Pioneer Award for this. Given the above declaration, an iptr is a pointer variable, i.e., a variable that holds a location to a place in memory. Furthermore, at that place in memory, a value of type int is stored. To take the address of something, we use the & operator (address-of). The following code declares a variable x that holds the value 42 (an int) and another variable iptr that holds a location in memory – the address of the x variable, written &x. The type of iptr is int * (pointer to an int). To get to the actual int value, we must dereference it using the * operator (dereference). The type of *iptr is thus int not int *. Furthermore, the value of *iptr is 42, and it is the very same value as stored in x. Thus, if we change x like so x = 43 – the new value is also visible through *iptr. And conversely, *iptr = 44 changes the value of x (but not the value of iptr – it still points to the same location in memory, even though the value at this location has changed). Every time you take the address of something, you add a level of indirection. Whenever you dereference something, you move closer to some concrete value. (take address) Adding & on the left-hand side of the \(:\) adds a corresponding * on the right-hand side. (dereference) Adding * on the left-hand side of the \(:\) removes a corresponding * on the right-hand side. You cannot add more than one & operator: &&x is never well-defined because the result of the first &x has not yet been stored in a place that has a location that we can take using another &. A classic mistake when programming with references is writing e.g., int *x = 42, thinking that this creates a pointer variable x that stores some unknown location where the integer 42 is stored. This is not the case! This creates a pointer variable x that stores the location 42, where an unknown value is stored. If you really need an unknown location, create it using malloc(): int *x = malloc(sizeof(int)); and then *x = 42. Now, x really points to some location (as returned by malloc()) that stores the integer value 42. Pointers lets us share data. Instead of passing in a copy of a value to a function, I can share the value with the function. No matter the size of the value – hundreds of bytes to gigabytes – its address still fits in 8 bytes (on a 64 bit machine), so that way of sharing is clearly more efficient. In C, pointers allow us to define recursive data structures because implicit in each pointer value is its possibility of being NULL, i.e., the absence of the location of some value. If example() happens to get called with the same pointer as both a and b, the second update will overwrite the first! This might come as a surprise! Who is responsible for freeing something? Not freeing causes the program to leak memory. Freeing more than once usually causes the program to explode. This code accesses x twice after it is freed: once to dereference it and read its value, and once to dereference and update the value. Neither is legal after the free() call! After the free() call, x holds a dangling pointer which must never be referenced. A defensive programming technique is to always set a varialble you have free()’d to NULL so that accesses segfault rather than live on for some part of some program! Throughout the course, we will see examples of when pointers are both great and cause all kinds of problems. Historically, pointers has been a hard concept to grasp, and pointers to pointers therefore logically must be exponentially hard? Actually not. You have probably written many programs that used this concept. For example, char *argv is an array holding pointers – and char **argv is an equivalent type. Dereferencing argv means reading a location in memory where a pointer – in this case to a null-terminated string – resides. Let us examine argv and its dereferencing. 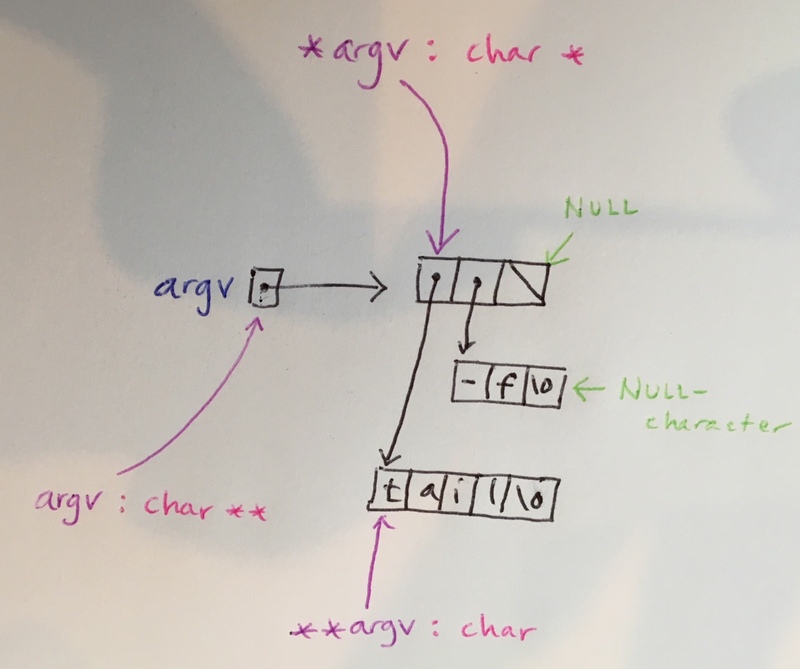 To concretise this, Figure 1 shows the argument vector argv of a program called tail invoked with the single command-line argument -f. Purple arrows shows the value of the purple expressions. The types of each purple expression is written out in pink. In this document, we will look at pointers to pointers and their use. We will look at linked lists as our driving example, because we know them well from previous “modules” in this course. To grasp the use of pointers to pointers in the upcoming example, we must first talk about pointers into structures. Commonly, malloc() and calloc()1 allocate some consecutive bytes on the heap and return a pointer to the “start” of this structure. For example, remember the link structure from before. Above, ptr, a and b are aliases, and allow us to access the same memory as different types. Let’s refer to ptr as the address of the place in memory where the link_t struct is defined. Through b, we are allowed to access the memory at ptr to read and write in elem_t-sized chunks2, because that’s what the type says is found at b. Similarly, through a, we are allowed read and write accesses in link_t-sized chunks3. Figure 2 illustrates the code above. The coloured line on each black pointer shows what part of the structure can be read through that pointer. Note that the void pointer cannot be dereferenced, meaning it cannot be used to read the structure at all. The macro offsetof() allows us to calculate the relative starting address in memory of a field in a struct.4 On the machine where this is written, offsetof(link_t, next) is 8. Thus the addressed stored in c is ptr + 8. Note that this address is inside the struct pointed to by a, that is a < c < a + sizeof(*a). This clearly shows how the number of *’s are “balanced” – to get closer to the value, add another star in front of the expression. Taking the address using & adds a * to the type, reflecting the additional pointer indirection. The number of *’s in the type of some variable x upper bounds how many times we can dereference x, i.e., write *x, **x, etc. Above, c exemplifies a pointer into a structure. Pointers to pointers can often simplify implementations by making things more regular, and getting rid of corner cases. When we implemented linked lists, we used a clever trick of inserting a sentinel link at the start of the node to simplify the implementation. This allowed us to define a find function that returned the preceding node. This allowed the find function to be used across multiple list functions such as insert, remove, and get. We will now see how we can implement a similar function but without the need for a sentinel. The trick is to return a pointer – not to a link, but to a pointer to a link. Such a pointer can be used both for reading and writing, allowing its use across multiple list functions such as insert, remove, and get, like before. Because a link_t * can be found both in the next fields of links and in the first and last fields of lists, a link_t ** can cover both these cases. Thus, there is no need for a sentinel link to be able to easily update the pointer to a link. We start by defining cursor – a pointer to a pointer – by taking the address of list->first using the & operator. Like we saw in the table above, list->first is a link_t * but &list->first is a link_t **. This pointer points to the first field in the list struct. Thus, even if an empty list is represented as a list whose first and last fields are both NULL, &list->first is defined, and not NULL6. Figure 3 shows the value of cursor after the first line of list_find() is executed. As is visible from the code, swinging cursor forward through the list is somewhat involved. Previous iteration in the list implementation used code like cursor = cursor->next. Now, we are forced to dereference cursor to read next and then take the address of the result: cursor = &(*cursor)->next. In plain English what this means is: read the address of the variable cursor, then take the address of the next field of the object stored at that location, and store the result in cursor. Note that turning this operation into two discrete steps is not possible. Consider declaring a temporary variable tmp to store the value of the next field, and then using &tmp to swing cursor forward. When list_find() returns, its will return a pointer to a variable (tmp) located on the stack frame that is just popped! In plain English what the first line means is: read the address of the variable cursor, then read the value of the next field of the object stored at that location, and store the result in tmp. The interpretation of the 2nd line: take the address of the local variable tmp and store that address in cursor. 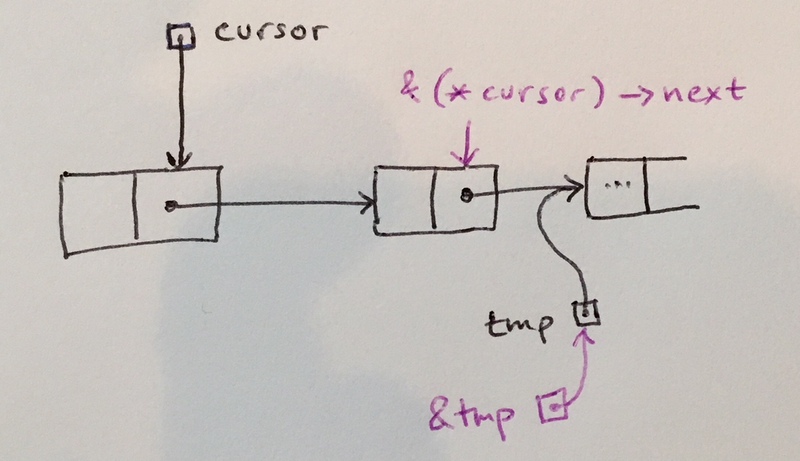 Figure 4 shows the difference between &(*cursor)->next and &tmp pictorially. Even if the stack frame is not overwritten by a subsequent function call, *cursor = new_link() will only update the (useless) value of tmp, a variable on a popped stack frame. Using the list_find() function is very similar to how we used list_find() in the past, except that we use *cursor both to read and write the field that cursor points to7. Above, we iterated over a list by pointing to the pointer to the next link_t in the list. This allows us to very easily implement functions that insert or unlink a specific link. This is even more powerful when it comes to less linear data structures. For example, when navigating a binary search tree, it is useful to keep a pointer to the parent pointer’s pointer to a subtree instead of simply the pointer to a subtree. This allows us to navigate to the subtree, but also update it, without caring whether the pointer is the left or right subtree. With this code, we can now in an easy way implement insertion. We simply obtain a pointer to the pointer to the place in the tree where we should add the new node. Let n be this pointer. Below, if *n is NULL we “fell out of the tree” going down some subtree where we expected to the key. In that case, we simply create a new subtree and update *n to point to that subtree instead of NULL. Pointers to values allows values to be shared across several places in the code such that a modification from one part becomes visible to another. Since pointers are just a form of value, a pointer to another pointer follows no special rules that do not apply to, say, a pointer to an integer. In linked structures, having a pointer to a next field instead of the value in that next field is often convenient, because that same pointer will allow you to both get the contents of the next field and set the contents. For a linked list, this is similar to having a pointer to the preceding link, but for a tree-shaped data structure, there is no “clean” alternative. And also realloc() and others. And naturally to access fields in elem_t, e.g., p.
And naturally to access fields in link_t, e.g., next. As an aside, offsetof(T, f) is calculated as &((T)NULL)->f. Note how this is defined even though this looks like a NULL dereference at first glance. Remember, ptr + 8 on the machine where this is written. A way to think about this is that the place where the NULL pointer is stored exists somewhere in memory. In other words, the field located at *cursor.